Heart disease, stroke and other forms of cardiovascular disease are the leading causes of death in America. They affect nearly 83 million Americans and cost the nation more than any other disease, according to the American Heart Association. With so many people dealing with heart-related diseases, lowering cholesterol levels is a must. Some have done this by using healthier methods to cook food—like using cooking oils, instead of butter and lard. But not every cooking oil is healthy for you. Polyunsaturated fats—like soybean, safflower and corn—lower both the good and the bad. 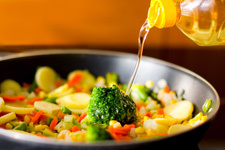 All oils are either poly or monounsaturated, unlike cooking solids like butter, which contains saturated or trans fats which increase bad cholesterol. Ms. Pletcher suggests that when shopping for cooking oils, try choosing olive oils for salad dressings and canola oil for cooking. Canola oil has a higher “smoking point,” which means it can be heated hotter without breaking down and becoming unsafe to cook with. The clinical dietician also warns not to be fooled by deceptive labels. In fact, healthy oils, although they are a good type of fat, still contain a high number of calories. Everyone needs a certain amount of fat to supply essential fatty acids and fat soluble vitamins, Ms. Pletcher said. Oils containing Omega-3 fatty acids can even help decrease health problems. But even though all of these oils can be healthful, there can be too much of a good thing. For more information, visit the American Heart Association or the American Dietetic Association’s sites. Do you have any healthful recipes that use monounsaturated oils like olive or canola oil? Share your recipes and advice to those looking to improve good cholesterol levels.